7 Ways to Use Clary Sage Essential Oil + Recipes! Clary Sage is a delightful oil that I have learned about this past year and have really enjoyed adding to my stash of essential oils. There are many ways to use it and several recipes you can try out. Here you will find 7 ways to use Clary Sage essential oil, as well as a recipe that’s a personal favorite and more information to help you make the most of this fantastic oil. Clary Sage essential oil (Salvia sclarea) comes from the distillation of the flowering tops and leaves of the clary sage plant, and is considered by aromatherapists to be a natural antidepressant and powerful relaxant. The scent of clary sage essential oil is also very appealing. The sweet, floral fragrance blends well with oils like lavender, ylang ylang, geranium, cedarwood, and sandalwood. What Does Clary Sage Essential Oil Do? 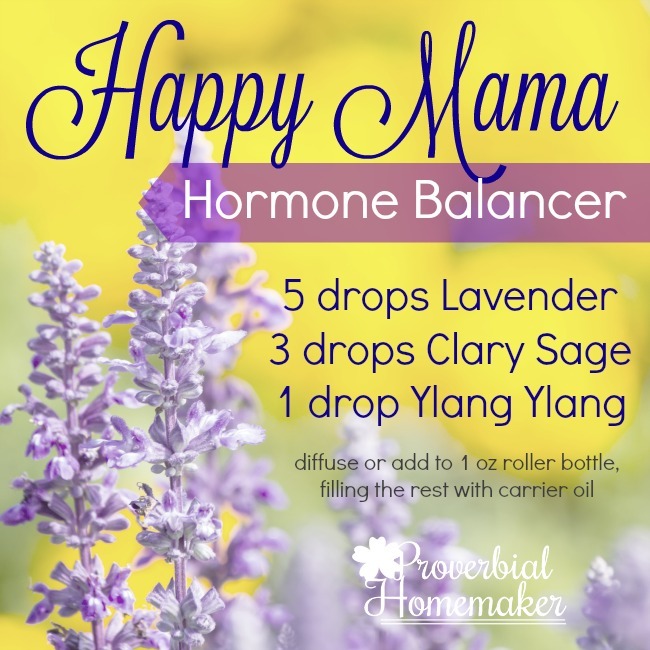 Blend the Happy Mama Hormone Balancer (below) as a roller bottle recipe or in your diffuser to help with your hormones. Switch out peppermint for lavender in that recipe and apply to help relieve hot flashes. Add 3 drops to 1 oz of a carrier like sweet almond oil for massage to alleviate menstrual cramps. Diffuse with lavender to calm the household or aid with restful sleep. Add 3 drops clary sage, 3 drops grapefruit, and 2 drops lavender to a roller bottle and massage into feet and ankles to relieve bloating and aches during period. Create a hair rinse to fight dandruff: Add 3 drops clary sage, 3 drops eucalyptus citriodora, and 3 drops lavender to 1/4 cup apple cider vinegar and 2 cups water. Keep in an empty shampoo bottle and apply to scalp as a rinse after shampooing. Add a few drops to coconut oil or your regular facial lotion to help clarify and moisturize the skin. This is the recipe I have been using Clary Sage with the most lately (well, before I became pregnant) to deal with the emotional and physical discomforts of hormone issues during PMS and menstruation. I’d often add a few drops to whatever I was diffusing as well, for a little pick-me-up. There may be moderate skin sensitization with clary sage. In Essential Oil Safety, Tisserand and Bouhlal recommend a 0.25% maximum dermal use level. That’s about 1-3 drops of essential oil per ounce of carrier. Some sites have suggested that clary sage is estrogenic and should therefore be avoided by people with breast cancer or during pregnancy. However, when I looked into it, the books I reference below both indicate that actual studies have shown clary sage has no estrogen-like activity and so there is no known reason to avoid it in those situations. If you want to stay on the uber safe side (which I tend to do), avoid using it during pregnancy except during active labor, where it appears to help with labor pains. Safe for children over 2 years old and for nursing mothers. 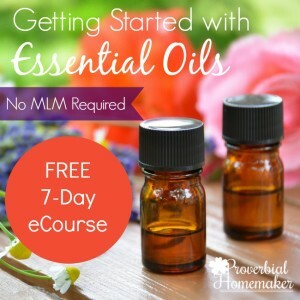 Looking for More Essential Oils Tips? Join my GROWING NATURAL GROUP ON FACEBOOK, where we share tips and recipes for essential oils, herbs, and natural living! Is there a good recipe for asthma, cough, and arthritis? For asthma, try 5 drops cypress with 5 drops lavender in a diffuser or with carrier oil in a roller bottle. For cough, I use Breathe Ease from RMO. For arthritis, Joint Support is a great blend. These are all RMO oils (http://go.rockymountainoils.com/SHMt) and for adults. Hope that helps! Thanks for sharing! As far as I know, this oil also benefit for our teeth. But I do not know how to use it for healing teeth diseases? If using this oils as a roller bottle where would you apply. I want to make this for a coworker of mine. They would apply it to the back of their neck, pulse points, or even the soles of their feet before bed. I dont have ylang ylang on hand. is there anything else you recommend mixing for anxiety, hormone balance? I have clary sage and lavender both just not the ylang ylang. You can use clary sage and lavender without the ylang ylang! After making the blend, do I put all of it (total of 9 drops) into the diffuser or just a few drops of the blend? How much water do I use? I fill my diffuser to the max line and add the indicated drops straight from the individual bottles to the diffuser. 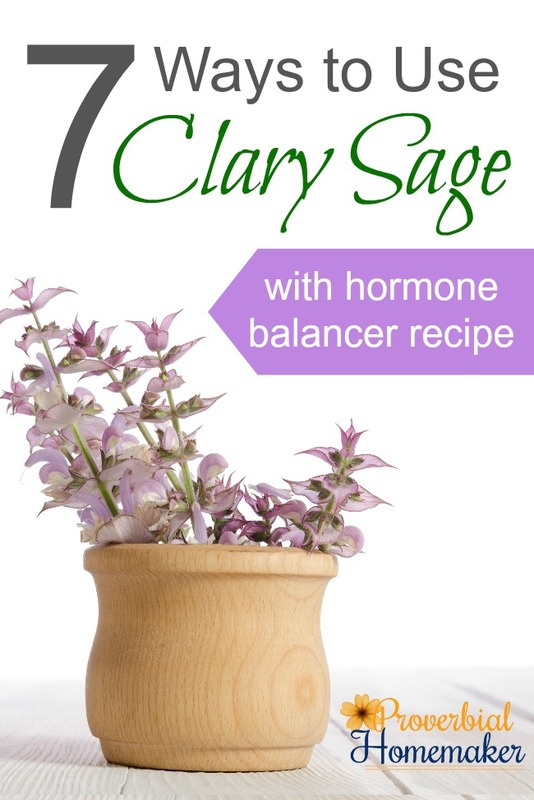 I heavily rely on clary sage for hormone issues! It helps relieve my hormone-related headaches (sometimes the ONLY thing that helps), the backaches & body aches, and definitely helps balance my moods. 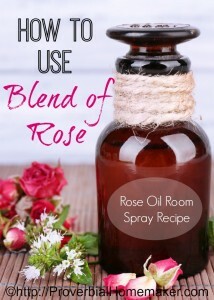 My 12 year old uses a blend with it as well., and my older niece uses a blend with clary sage for her cramps, too. I love this stuff. I didn’t like the smell at first, but it has become so comforting, now I appreciate its beneficial effects! Apply it diluted topically (on neck, behind ears, bottom of feet, on abdomen or back, etc.) or diffuse! I have been using clary calm with good results and now I have the straight clary sage. I’m grateful for these recommendations for mixing. Btw the clary calm has really helped my kiddos with virus related visual disturbances… Idk if anyone else has experienced this, but sometimes when my younger 2 get sick they feel like everything is far away or enormous, which causes some anxious feelings! Hurrah for something to calm this! I’ve read that Clary Sage is good for treating lung Cancer. I thought I might give it a shot with my Dad. Is there a recipe that I could use? Also, should I apply on his chest or should he try inhaling it? I don’t know a recipe for that but I would try diluting it with a massage oil like jojoba and adding some frankincense. Then rubbing on the chest would be a great way to do it! You could also add 5 drops each to a diffuser and use it that way.